HONG KONG, Apr 28, 2016 - (ACN Newswire) - CITIC Telecom International CPC Limited ("CITIC Telecom CPC"), a wholly-owned subsidiary of CITIC Telecom International Holdings Limited ("CITIC Telecom") (SEHK: 1883) today announced its acquisition of the telecommunication business of Linx Telecommunications B.V. (Linx Telecommunications), including Linx's 470 kilometer optic fiber network in the Baltic Sea, and its network operations centers (NOCs) in Moscow and Tallinn, Estonia. The acquisition also includes Linx's data center in Tallinn, which serves as Estonia's largest Internet Exchange (TLL-IX). Currently undergoing customary regulatory approval, the acquisition is expected to complete in the second half of 2016. The acquisition extends CITIC Telecom CPC's global footprint to Central Asia and Eastern Europe markets, further strengthening the company's global reach-which already includes Asia-Pacific, North America and Western Europe-and greatly enhancing CITIC Telecom's ability to capture opportunities arising from China's "One Belt, One Road" economic cooperation initiative. Mr. Xin Yue Jiang, Chairman of CITIC Telecom International Holdings Limited said: "Our mission is 'Connecting The World with Quality Service' and the acquisition of these important telecommunications assets is significant to our development strategy of expanding business internationally and increasing global network coverage, keeping Mainland China as the foundation of our business, with Hong Kong and Macau serving as both base and springboard to more opportunities." Chairman Xin added: "We are leveraging Linx's extensive network resources and experience in Central Asia, Central and Eastern Europe to significantly boost our access to, and capability to handle, opportunities from the "One Belt, One Road" initiative, in addition to addressing and better serving our customers' business needs in these regions." 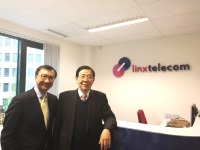 CITIC Telecom CPC is acquiring extensive telecommunications infrastructure and business operations that Linx has built to service customers in 14 countries with 24 points of presence (POPs) across Western Europe, Central and Eastern Europe, as well as Central Asia. With a wealth of local experience and advanced technologies, Linx Telecommunications has been investing heavily in constructing extensive networks and providing a variety of bandwidth services, including a 470 kilometer submarine fiber network covering the countries surrounding the Baltic Sea which connects Sweden, Finland and Estonia. The majority of its customers are major companies which require data services, such as Ethernet circuits, bandwidth services, MPLS virtual private networks, data centers and cloud computing. The acquisition of Linx Telecommunications is a testament to CITIC Telecom CPC's commitment in capturing opportunities brought about by the "One Belt, One Road" Initiative as announced by China in 2015. The network services provided by Linx cover a high-growth potential market which includes Russia, Kazakhstan and the "Stan" region, the Baltic Sea and Eastern Europe. Because both companies have a similar customer base, comprising multinationals, the acquired assets will enable CITIC Telecom CPC to readily strengthen its development and strategy for markets in Central Asia and Eastern Europe. 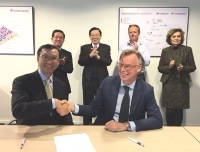 This latest acquisition will also further reinforce CITIC Telecom CPC's capabilities in managed networking services, cloud computing and other managed value-added data services. Moreover, Russian language proficiency among Linx Telecommunications team members joining CITIC Telecom CPC, as part of the acquisition, will bring added competence in expanding business in the region. "The acquisition of Linx Telecommunications will enable CITIC Telecom CPC to expand our reach to markets covered by the 'One Belt, One Road' Initiative. By extending our footprint to Russian-speaking markets and Central Asia, we will enhance network access for our existing customers and facilitate greater business growth across Asia and Europe," said Mr. Stephen Ho, CEO of CITIC Telecom CPC. "With this new competitive advantage, we will continue to support the 'One Belt, One Road' Initiative through ongoing investment and development of telecommunications infrastructure and premium ICT services. I am confident this acquisition will bring new business opportunities, enhance overall efficiencies and elevate our growth to greater heights." The "One Belt, One Road" Initiative aims to foster growth and closer cooperation in trade links, capital flows, infrastructural investment and policy coordination in Asia, Europe, and Africa. It is expected that investment by China under the Initiative will double within the next three years, reaching a total of US$200 billion. Currently, The Asian Infrastructure Investment Bank and Silk Road Fund are the two major financial institutions involved in the Initiative, with additional investment from the Russia Direct Investment Fund in the pipeline. CITIC Telecom CPC delivers a range of innovative services, including: TrueCONNECT(TM) - an advanced MPLS VPN service which employs state-of-the-art fully meshed network, TrustCSI(TM) - an integrated suite of information security solutions, DataHOUSE ? converged cloud solution and global unified management datacenter solutions, and SmartCLOUD(TM) ? smarter, better and high performance cloud computing solutions which complement the company's managed network, managed security, and managed cloud data center solutions. As further testament to its commitment in providing premium quality services in the Asia Pacific region, the company became the first VPN service provider in Hong Kong to achieve all four ICT related certifications in ISO 9001 ? Quality Management System, ISO 27001 ? Information Security Management System, ISO 20000 ? Information Technology Service Management System, and ISO 14001 - Environmental Management System. Learn more atwww.citictel-cpc.com. The Linx Group (Linxtelecom & Linxdatacenter) is an international telecommunication and carrier neutral data center solutions provider. Headquartered in Amsterdam and with offices across Central and Eastern Europe region, and Russia, it bridges East with West, providing highly secure and advanced IT solutions to its customers. The Linx Group's unique proposition, which differentiates it in the market and simplifies data management process for the customers, is based on integrated offering of Data Center, Connectivity and Cloud solutions. The synergy of Linxtelecom and Linxdatacenter, as well as around the clock technical support, creates a 'one-stop-shop' platform for clients' data and IT needs and, therefore, maximizes the value received. Bank Street Group LLC served as exclusive advisor to Linx Telecom in the transaction.